You’ve put in all the hard work of piecing together your quilt top and now it’s time to finish the job— make your “sandwich” and quilt the thing! But in order to do that, you still have to choose a backing. It seems simple, right? Who even looks at the back of the quilt? But you still have a few decisions to make! One main thing to consider is how you plan to quilt your quilt. If you’re hand quilting or doing more elaborate free motion quilting, you may want to showcase that detail more. Choosing solids or prints with more negative space will let the lines of your quilt work shine. This Yuwa lawn is soft, with lots of negative space, showing off the detail in hand quilting. This solid green background really makes the quilting pop! If you’re a beginning quilter, are just straight line quilting, or maybe you just haven’t mastered the art of consistent stitches in free motion (like me), a busier print might be the better option for you! The right print will make your stitches almost disappear. Carolyn Friedlander's Architextures crosshatch is graphic and busy, distracting from potential mishaps in stitching. The quilting on this white on red dot is almost invisible! And don’t limit yourself to simple quilting cottons! In addition to giving a quilt a totally different feel, choosing a different substrate like flannel, Cuddle, terry cloth, or even just using a high loft batting/wadding can help hide imperfect stitching, especially after a good wash. Here's the real question though: how much fabric do you need to buy for your backing? 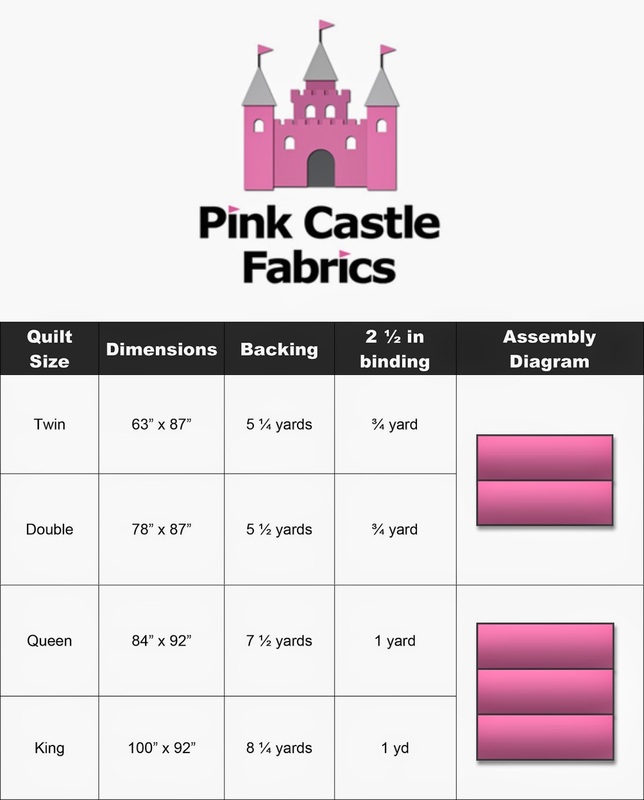 That calculation doesn't come easily to my mind either so we've put together a handy little chart for you to reference back to or even print and post in your sewing room! Backings are an often under appreciated element of quilts. Whether you use one print continuously through your backing or take the time to piece a strip or segment with fabrics from the top, different choices for color, print, and texture can totally change the look and feel of your work. Now with all this in mind, it's time to go out and finish some of those tops I know we all have piled up at home! All the machine quilting featured above was done by Kathy Koch of Thread Bear Quilting. Hand quilting work was done by Cherie Grzych.